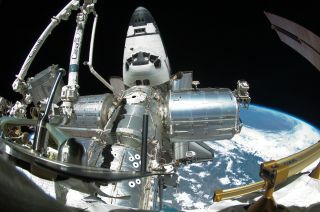 Parts of the International Space Station and docked shuttle Endeavour are featured in this image photographed by NASA astronaut Mike Fincke using a fish-eye lens attached to an electronic still camera, during the STS-134 mission's fourth and last spacewalk - the last EVA ever to be performed by a NASA shuttle crew on May 27, 2011. HOUSTON — Astronauts on NASA's shuttle Endeavour will perform an unprecedented maneuver at the International Space Station overnight Sunday (May 29), when they undock from the outpost, then return again to try out a new docking system. Endeavour is due to undock from the space station Sunday night at 11:55 p.m. EDT (0355 May 30 GMT) after nearly two weeks visiting the orbiting lab. It's Endeavour's final flight before being retired along with the rest of NASA's shuttle fleet this year, so the space agency has added a twist to its orbital departure. The Sensor Test for Orion Relative Navigation Risk Mitigation, which NASA calls STORRM for short, will test a new docking camera and navigation system specifically designed for rendezvous and docking operations on next-generation U.S. spacecraft. STORRM uses advanced laser-based sensor technology and high-definition imagery to detect the distance to objects from as far away as 3 miles (5 kilometers) or as close as 5 feet (about 2 meters). Hu and his team are developing STORRM's capabilities for use with NASA's newly announced Multi-Purpose Crew Vehicle (MPCV), a spacecraft being built for deep space exploration. After Endeavour physically separates and backs away from the station, the shuttle will fly around the outpost at a distance of about 600 feet (183 meters) as the STORRM sensors collect data and images. This maneuver is scheduled to begin at around 12:22 a.m. EDT (0422 GMT). The orbiter will then make a second loop around the space station from a distance of about 1,000 feet (305 meters), before completing a "re-rendezvous" with the station at a trajectory that would match the flight plan for the MPCV/Orion capsule, which comes in at a different angle than the shuttle. Endeavour's closest re-approach to the station is expected to be at 3:28 a.m. EDT (0728 GMT). After Endeavour completes the STORRM rendezvous maneuver, the shuttle will resume regular separation procedures to prepare for its scheduled landing on June 1. A lab test of the retroreflectors, laser and sensor system of NASA's STORRM docking system prototype to be tested during the shuttle Endeavour's mission STS-134. In addition to being used for the MPCV, STORRM is also part of the proposed navigation system for NASA's sample-return mission to an asteroid, slated to launch in 2016. That mission, called OSIRIS-Rex, will arrive at an asteroid called 1999 RQ36 in 2020. If the undocking tests during Endeavour's STS-134 mission are successful, and if STORRM is selected as part of the instrumentation for the OSIRIS-Rex mission, the laser-based sensor technologies could help the unmanned spacecraft navigate to, and arrive at, its target space rock, NASA officials said. During its initial flight test, the STORRM team is hoping to gather data on the accuracy of the optical sensing tools that will allow them to build up an imagery database to help refine the technologies in the prototype system installed on Endeavour. "The best way to reduce risk is to test in the space environment, and test in a relevant environment, and the best relevant environment we have is the International Space Station," Hu said. "And, of course, the space shuttle is a great test bed for us."